My Name is Zelah Green and I'm a cleanaholic. I spend most of my life running away from germs, dirt, and people. And I'm just about doing ok and then my stepmother packs me off to some kind of hospital to live with a load of strangers. It's stuck in the middle of nowhere. Great. There's Alice who's anorexic. Caro who cuts herself. Silent Sol who has the cutest smile. And then there's me. 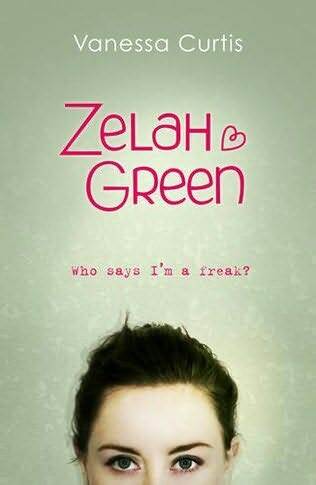 I really loved Zelah Green by Vanessa Curtis. I was told beforehand that it's a very loose retelling of Snow White, but if I hadn't known that, it probably wouldn't have been obvious to me while reading it as there is so much that is different. And I do love a really original retelling. Instead of being perfect and beautiful, like Snow White, Zelah Green has plenty of problems. She begins her story by explaining her unusual name with a really romanticised ideal of what might have happened and then shatters it all with a bit of reality. Her parent's arguing, her mother choosing a name out of spite. It's not a fairy tale with this book. Zelah's mother's death really affected her and instead of dealing with her wild emotions and grief, she tried to force it all away and focused on other things that she could control. So begins her obsessive compulsive disorder. Washing each hand 31 times. Not being able to touch other people or anything that might be unclean. Sitting on a tissue everywhere she goes. Being on Germ and Dirt Alert. Those rosy cheeks that Snow White is famous for? Zelah's cheeks are red from all the scrubbing she does. When Zelah's father goes missing, she's left with her step-mother who doesn't really understand her. The step-mother asks her neighbour to drive Zelah off to a mental institution instead of dealing with Zelah's 'little problem.' But Heather, Zelah's neighbour can't bring herself to do that, and instead takes 14 year old Zelah to Forest Hill House, where a whole house of troubled teens live, each battling with their own demons. There, Zelah is able to understand herself and her OCD a little better, come to terms with some of the events that led her here in the first place and move on, just a bit. But it isn't easy. I really loved the people at Forest Hill House. From The Doc, Zelah's behavioural therapist, Josh, her Jesus-lookalike husband. The other teens - Alice, dealing with anorexia. Sol who doesn't speak. Caro, who had such an attitude and cuts herself. Each had their own stories and grief to deal with and they are a far cry from the happy dwarves of the fairy tale. Zelah is an interesting character, I've never had much experience with obsessive compulsive disorder and I did learn quite a bit about her mental processes dealing with her impulses. She had a great voice and while sometimes she did observe the actions of behaviours of those around her, Curtis did a great job of letting the reader come to their own conclusions about what is going on. This book was a really wonderful and gritty alternative look at a modern-day Snow White. Zelah Green opened my eyes about OCD and it's symptoms while at the same time giving us a very likeable main character who we can all root for and get behind. This has been on my must read forever. Wow, I've got some seriously catching up on your blog to do :) But I figured I'd start of with this one because I don't think I've ever heard of a book like this before. I don't think enough is written about OC disorders, and I've been looking for reads like this one for quite some time. Your review has more than intrigued me - so I'm going to be on the look out for it here. I came over specially to check out this review as I've just seen the book on another blog too. You mentioned in the comments that you'd read it. It sounds really interesting. I'm going to see if I can order it. Slowest Bookworm - Thanks for searching for it specifically, it was a very interesting book to read! I do hope you can find a copy - I picked mine up in my local Waterstones!